Matt 18:2 For wherever 2 or 3 are gathered (drawn together as my followers) in (into) my name, there “I AM” in the midst of them. We take so lightly the presence of God. He is with us all the time. He loves when His people come together. He loves when they worship & learn of Him together. Malachi 3:16 (AMP) Then those who feared the Lord talked often one to another, & the Lord listened and heard it, AND a book of remembrance was written before Him of those who revered & worshipfully feared the Lord & who thought on His name. WOW, God listens to us when we gather together in His name and talk about Him. He writes it down as a parent would record their children's life. He writes it down in a book of remembrance. And someday as the next verse says “He will publicly recognize us as His jewels, His special possessions, His peculiar treasures. He loves us and He loves when we gather in His name. God does not want us to be alone. We are stronger when we are together. Ecc 4:9-10 Two are better than one, because they have good [more satisfying] reward for their labor; for if they fall, then one will lift up his fellow; But woe to him who is alone when he falls & have not another to lift him up! Heb 10:23-25 So let us seize and hold fast and retain without wavering the HOPE we cherish and confess and our acknowledgment of it, for He who promised is reliable (sure) and faithful to His word. ANd let us consider and give attentive, continuous care to watching over one another, studying how we may stir us (stimulate and incite) to love and helpful deeds and noble activities, NOT forsaking the assemble together [as believers], as is the habit of some people, BUT admonishing (warning,urging, and encouraging) one another, and all the more faithfully as you see the day approaching. Hard times are coming and we need each other. We need to help one another. Reach out to your fellow brother and encourage him. God loves when His children come together and help each other. He loves it so much that He has a book of remembrance. Just as we do for our children. I can see God saying “Oh look at my little ones, look how they help one another, That is my child, Oh how I love them”. He cares so much for us and He wants us to be together in hope, in Love, in unity, IN HIM!!!! By the grace of God, I started out living for Jesus many years ago. Along the way I have stumbled and made many mistakes and missteps. Always and without exception, when I reached out for the Lord to pick me up, He did. Never has there been a time when He left me to my own devices or to wallow in my defeat. Because of the finished work of Christ upon the Cross, I am saved today and preaching this glorious gospel. Whether on the mountaintop or down low in the valley, the object of faith has always remained the same; Christ and Him Crucified. There is no other solution for any of us nor do we need any other. We live in a world today that is very, very different from the world at the time I received Christ. Today, political correctness is all the rage and tolerance is demanded. Compromise is on the lips of many top christian leaders these days. Nowadays, so many in the church are trying to mix Jesus in with the rest of their “stuff”. In the world of seeker-sensitive evangelism it is a crime to mention the word sin or to call men sinners. I never would have gotten saved had not a true man of God told me that I was a sinner that needed a savior. I did not receive Christ for life enhancement; I received Christ to escape the wrath to come. I have broken the laws of God, as we all have, and can do nothing myself to set it right. I need and in fact must have, a savior. I did not receive Christ to merely “enjoy the trip”, I want to be saved from the judgement at the end of the trail. The Lord Jesus Christ is the only way that man-kind can become right with God again and though that is not popular today, I will never quit preaching it. It is the truth! No power in this world [or in the church for that matter] can compel me to change my convictions just because a mob wills it. When a preacher like Joel Osteen states that he never mentions the Cross or sin, how can people truly be saved?When we allow a man like Rick Warren to try and bring all religions together in our christian churches, what does that say about the significance of our faith in the Lamb of God? And by the way, isn’t Jesus enough purpose? Did not Jesus provide us with the real “Purpose Driven Life” when He went to the Cross? 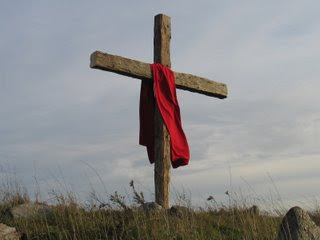 Why do we seem to think we need some fad to take the place of what Jesus did for us at Calvary? Just like David did, you and I need to stop hiding from the things we fear and go after them face-to-face. Shake no hands with the enemy. If you are a true gospel preacher, then do not negotiate with the powers of hell. Don’t flirt with your enemies and do not let them flirt with you. The enemy and his demons are not in charge of me. Refuse to allow anything or anyone to conform you to the spirit or the ways of the world. Do not be conformed, but be transformed into the image of Jesus Christ. [Rom.12:1-2] We need to boldly march into these last days and follow the path least chosen instead of following the path of least resistance. The world and the modern liberal, seeker-sensitive church can do as it desires; But as for me and my house, we will serve the Lord. [Joshua 24:15]. Its high time to cease halting between two opinions and choose this day whom you will serve. As for me, I will take the way of Calvary. DO NOT FRET... do is to have action and do something. Do not means to stop doing something. This means we are doing something that we should not do. Matt 6:32-34 ...your heavenly Father knows well that you need them all(daily needs) He knows what you need. vs 27 who of you by worrying & being anxious can add one unit of measure to his stature on to the span of his life. But seed)aim at & strive after) forst of all His kingdon & His righteousness (His way of doing & being right_, & then all these things taken together will be given you besides. So do not worry or be anxious about tommorrow, for tomorrow will have worries & anxieties of its own. Suffiecent for each day is its own trouble. Run away from everyone & everything not of God. Worship Him for who He is! God's goodness leds to repentance. We have no business having a relationship with sin, only unbroken fellowship with God, through Jesus. Don't be a slave to anyone or anything. We have eternal life NOW, live it, think it, walk in it, share it, & proclaim it. Anything we do that is birthed out of the flesh, Satan has legal access to that area. But when we place our faith in what Jesus did at the cross, that gives the latitude to the Holy Spirit to work in your life. Base your faith on the word, not on your experiences. Set your affections on things above, not on things of this world. For things here are temporal. Reach out to those around you in need. Don't be selfish. He has helped you, why would you not help others. The Wages Of Sin Are Not Pleasant To Behold. No heart can rejoice in the sight of a man destroyed, even though it is by his own doings. Sin is the fountainhead of all sorrow, and it is the mother of all tears. Sin is a mighty destructive force. Sin is never satisfied until a life is ruined, disgraced, and brought into shame. Then look at mighty Samson, champion of Israel, “grinding in the prison house” with his hair cut and his eyesight gone, having become the laughing stock of Gaza. Look at David, the sweet singer of Israel. No one could play the melodious tones of the golden harp like David could. See him, this great warrior of Israel, as he stands over the lifeless body of his ill-gotten son, unshaven, unkept, brought into open shame for his sin. There is only one way to avoid the tragic consequences of sin, and that way is CHRIST. I am so excited about our new booklet. Len has done a very good job with giving our readers everyday steps that need to be taken to have our needs & those of other met. This anointed booklet shows that we only can walk right when we spend time with our Father. Chapters include: Prayer is the Key, The Holy Spirit, Fellowship with God,The Mind of the Lord, how to pray in difficult times and much more. Please feel free to write or e-mail us as to how you can obtain your copy[s] today. This little booklet is easy to read and it doesn't matter if you are brand new to prayer or a seasoned prayer warrior, we feel this will be a blessing to your life. This comes in a packet of material so contact us for the suggested offering. Happy Birthday Buddy! I Love you. You are my best friend. I am very proud to be your wife. We have been through so much in our lives and we are still going strong. We glorify God for our marriage and give him glory. I am so proud of you. You are a man of God and I am very blessed!!!! Without Him you can do nothing! IN HIM is all fullness of joy! Who has blessed us with all spiritual blessings in Heavenly places IN CHRIST! He has chosen us IN HIM! He has made us accepted IN THE BELOVED! IN WHOM we have redemption! IN WHOM we have obtained an inheritance! IN WHOM you were sealed! IN CHRIST JESUS who has made us to sit in heavenly places! THROUGH HIM we have access to the Father! We are partakers of His promise IN CHRIST! IN WHOM are hid all treasures of wisdom & knowledge! Without HIM you are nothing. Do you really think that you can cause your own eternal life? Do you think so highly of yourself that in this life you can save yourself or that by your own works you can do anything eternal? We think so highly of ourselves we really miss what God wants to do in us and for us. He has eternal life. He knows all things. He has a plan and purpose for us. All things work out according to His plan if we would only look to Him. When we are IN HIM and ABIDE IN HIM we can do all things and all things we do will glorify God. We can be at peace and truly rest IN HIM. So often we just go through our day as it comes with no direction or forethought. We must pray and ask God to led us and guide us. Only when we abide in Him daily can we be over comers. Why are we here? For what purpose is our life? SELF? OTHERS? WORK? He wants so much to have fellowship with us that He sent His only Son to die, so we can be one with Him. He wants to walk and talk with us. He calls unto us to be with come, “Come unto ME”. “Walk with ME”. Soon we will spend all eternity with Him, why would we go day by day and not spend time with Him. He loves us and has provided to us HIMSELF!! So don’t just go through your day as if there is no reason you are here. Don’t just bypass all that God has for you IN HIM. Daily seek, search, abide, look to, be in, knock, move in, pray to, be with, HIM!!!! Joshua 1:9 ... be strong, vigorous, & very courageous. BE NOT AFRAID, neither be dismayed for the Lord your God is with you where ever you go. PSALM 1 - THE LORD KNOWS MY WAY. HE KNOWS MY WAYS & MY HEART. NO MATTER WHAT OTHERS SAY OR DO, IT DOESN'T MATTER. THE ONLY THING THAT MATTERS IS THAT GOD KNOWS ME & MY WAYS. HE IS FULLY ACQUAINTED... HE LOVES ME & CARES FOR ME. PSALMS 2- BLESSED ARE ALL THEY THAT PUT THEIR TRUST IN HIM. AS I SEEK HIM & PUT MY TRUST IN HIM, THEN I AM BLESS. ALL OF PSALMS 2 SHOWS GOD IS IN CONTROL. PSALMS 3 - THE LORD IS A SHIELD FOR ME, THE LIFTER OF MY HEAD. WHEN I CRY TO THE LORD HE HEARS ME. HE SUSTAINS ME. I WILL NOT BE AFRAID. HE WILL TAKE CARE OF MY ENEMIES. BLESSING IS UPON ME BECAUSE I AM THE LORD'S. PSALMS 4- THE LORD HAS FREED ME, HE HAS SET ME APART, HE HEARS ME. HE PUTS GLADNESS IN MY HEART. HE MAKES ME DWELL IN SAFETY. PSALMS 5- MULTITUDE OF THY MERCY. HIS MERCY IS NEW EVERY MORNING. HE DEFENDS ME. WITH FAVOR HE COMPASSES ME AS A SHIELD. PSALMS 6- THE LORD HAS HEARD THE VOICE OF MY WEEPING. THE LORD WILL RECEIVE MY PRAYER. HE HEARS ME. HE ANSWERS. HE RECEIVES ME. PSALMS 7- HE HAS SAVED ME. HE HAS DELIVERED ME. HE IS MY DEFENSE. EVEN WHEN THE ENEMY THINKS HE HAS DEFEATED ME, THE LORD KEEPS ME SAFE. I THINK PSALMS IS ONE OF THE MOST READ BOOKS IN THE BIBLE. DAVID WAS A MAN AFTER GOD'S OWN HEART. HE WENT THROUGH MANY THINGS AS WE DO. IT ENCOURAGES US TO CONTINUE TO WALK UPRIGHTLY AND TO ALWAYS LOOK TO GOD FOR ALL THAT WE NEED. "THE HELP OF THE HOLY SPIRIT"